…this evening. RTÉ puts it slightly differently. 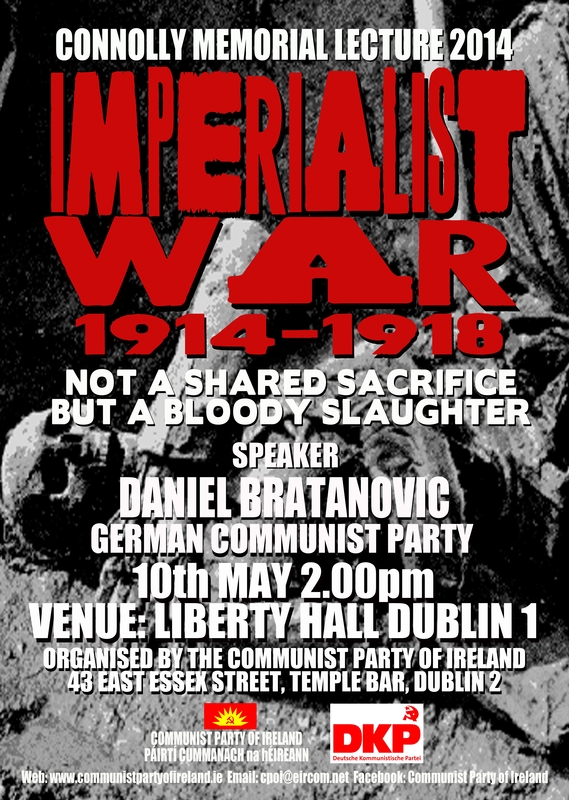 Posted by WorldbyStorm in Irish Left Online Document Archive, Irish Politics, The Left. …there’s always this to go along to at 6.30pm at the National Print Museum. 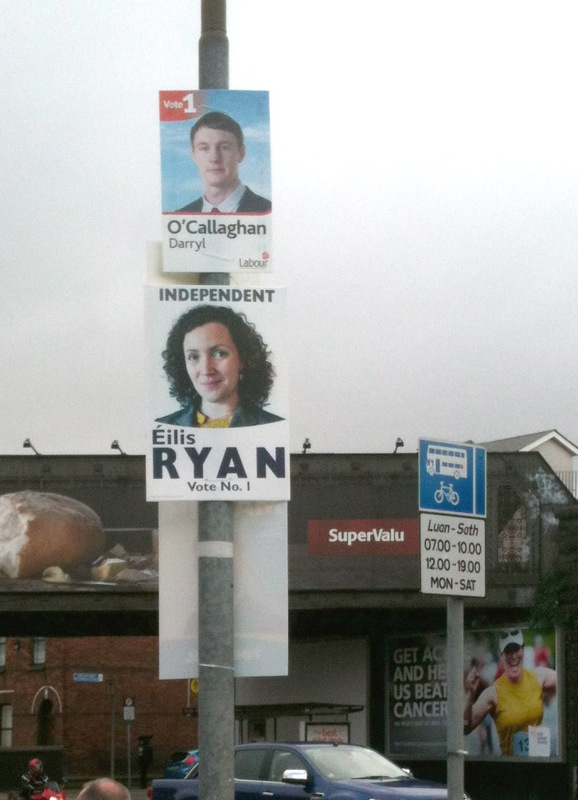 Alan and myself were talking today and the thought struck us to invite people to post up photos of posters from this election – a sampling as it were. We don’t have a particular home for them as of yet but it would be good to get as broad a range as possible. We’ll post up images too that we take. Here’s a few to get the ball rolling. A while back I was asked as a favour (given that I have Photoshop) to rearrange a map for someone of the European constituencies. This individual wanted a single map of the entirety of a certain constituency. In doing this and looking at the map of Ireland as a whole I couldn’t help but notice that if one were to try to compress Midlands North-West into a neat rectangle you’d have a bit of a job. It stretches north and east, or south and west (depending upon taste), in a near chaotic fashion dictated by the curious dispensation left in the wake of partition – or if you prefer, the erm… basic geography of this island and how it interacts with that dispensation. Meanwhile, reading Harry McGee’s piece on much the same topic in the Irish Times this week it’s hard not to sympathise that the three constituencies are a mess of near epic proportions. Four constituencies have become three. But as noted above what remarkable constituencies two of them now are. McGee suggests that a sort of political contiguity has been lost and with it ‘an MEP from west Cork can somehow be seen as a geographical representative for a constituent living in Bray’. I don’t know, that sort of stuff is overblown, particularly given the nature of the European Parliament. Midlands-North-West with Carlow-Kilkenny thrown in for good measure? The new constituency of Southern Ireland plus Dún Laoghaire-Rathdown? It was suggested by the Green Party at the submission stage but could not be entertained, because it fell outside the terms of reference. That was to make the whole of the State into one 11-seat constituency. Such a scenario could have a transformative effect. The constituency would have a coherent nature. It would encourage national and European-level debate rather than localism. They would represent Ireland, not a hodgepodge of counties. It would favour ideas. It would be quite distinct in all respects from a Dáil election. And, of course, the way elections go, there would still be a good geographical spread. Northern Ireland, Scotland and Wales are single constituencies for the purpose of European elections. 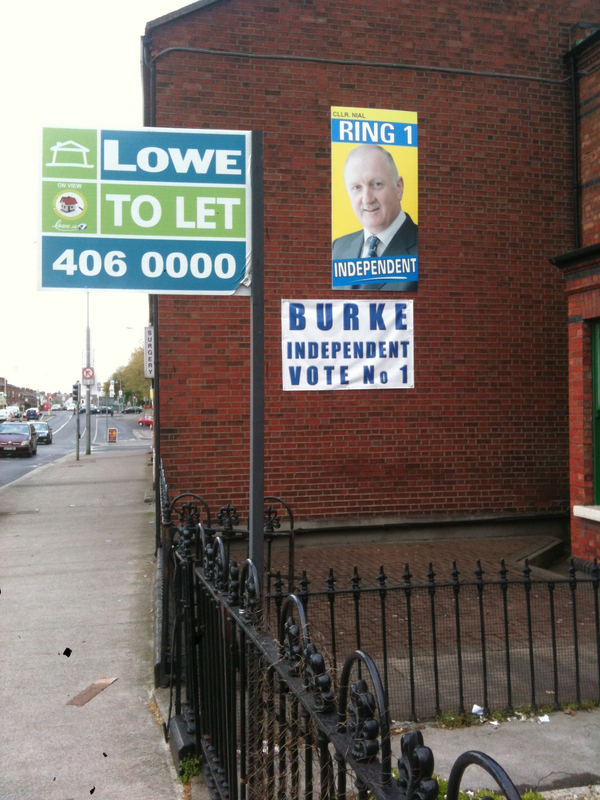 Fianna Fail’s prospects in the local elections have been hit by the decision of 19 party loyalists to run as Independents. In almost all cases, they were unable to get selected to run by the party at a time when the number of seats in rural areas has been cut back and town council seats are being abolished. And they include three former members of Fianna Fail’s national executive. The party has accepted that some of them will win seats. Many of them have been members for over 40 years, such as former Fianna Fail Senator Dan Kiely (74) who is running as an Independent in North Kerry after serving as a Fianna Fail councillor for 27 years. ”I’m getting an unbelievable response at the doors. In all my years canvassing, I never got a better response. Maybe people feel sorry for me in the way I was treated, he said. Would that it were truly unbelievable, but no, I can believe him. Anyhow, it’s a small party’s worth of candidates at 19 and if even half are elected, particularly if they are elected over official nominees, that will cause some ire. 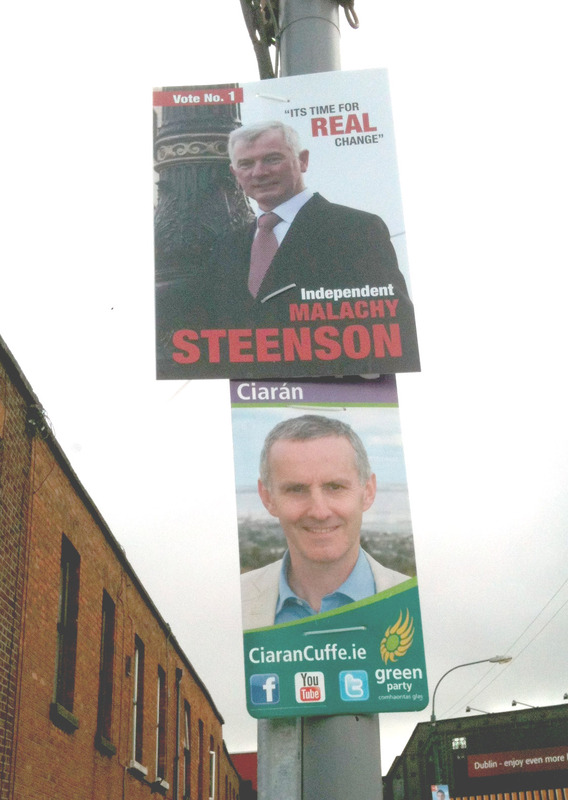 Still, it may simply prove that the FF brand remains so toxic that only those who scuttle away from it are electable. But let’s not forget those who departed before the last local elections. There’s a fair few of them too and that’d be another small party’s worth. The thing is that once one is elected under the Independent banner, particularly if one hasn’t been elected before on an official ticket, it becomes improbable that one will go back to the earlier political home. There’s lots of reasons for this, but caution is probably the most important one. Simply put it’s a risk – an ‘independent’ identity that has been successful has been carved out and proven its worth – and with the current incarnation of FF it’s a greater risk. Still, every bit of additional turmoil only adds to the entertainment value. Perhaps this set of local and European elections do count for little enough as was discussed yesterday, though I’m not convinced of that thesis, but without a shadow of a doubt they’re enthralling in terms of seeing how people get on. Or not. …in this report on the latest addition to the Naval Service, the L.E. Samuel Beckett which arrives at Haulbowline tomorrow. About 100 people gathered to watch the launch and the vessel was played out into the estuary by the Appledore Town Band, which performed Amhrán na bhFiann – to much cheering and delight. …not necessarily the time to say anything about this evening’s news. But… some food for thought in the Judge’s comments. He said [the then regulator] Mr Neary seemed to have limited recall and difficulty in recalling vital events, but he was satisfied he knew of the general situation. He said he had “no doubt” he told Mr Drumm that he was anxious to have the matter resolved. Both Mr Horan and Mr Neary “must have known” the bank intended lending to buy its shares and it seemed “incredible” that the regulator did not take advice as to the legality of the loans. “It is incredible that red lights didn’t go off somewhere in the regulator’s office,” Judge Nolan said. “I am totally surprised the regulator did not give any warning to Anglo Irish Bank,” he said. Not so surprising perhaps to many of us here. 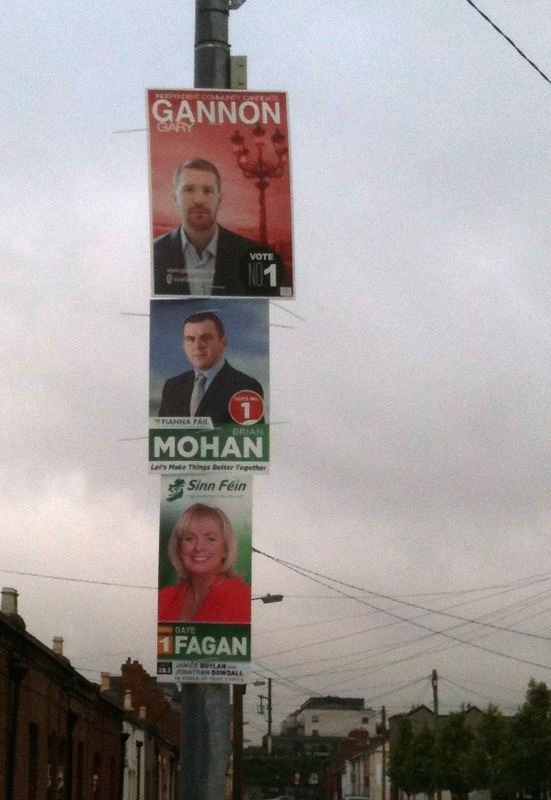 Surely there has never been such a hyped local election in our history. And yet, and yet, if nothing else it provides an opportunity for us to vote, and to represent our interests as citizens and voters. And collectively it offers an insight into the broader political dynamics away from polls which are perhaps skewed in one way or another. So let’s not be completely negative about it. There was a quaint time not so long ago when parties held conventions a month or so before the vote and hoped that their candidates had a high enough profile to make an impact. Now we have the peculiar institution of Local Area Representative. Invented by Fine Gael in the early days of the Flannery Plan’ it is now used by every party to run what is a near permanent level of campaigning. The Representative’ is in fact representative of no one but the party headquarters and its desire to leave as little to chance as possible. But it’s not just party candidates who are doing this. I was thinking much the same the other day when reading some of the output from Independent candidates as well. So many seeking to make representation on my behalf. I hear that local government bodies last month began to refuse to answer questions from anyone not an elected Cllr, and in fairness who could blame them? There is huge money being spent on winning as many of the 949 council seats as possible. Every backroom is in overdrive producing leaflets, buying ads, organising canvassers and getting posters put up. There’s definitely some money being spent out there, though print costs are lower now than they would have been say twenty years ago so you get more bang for your buck. Though that’s little comfort for the individual. This increased ground-level activity has been accompanied by an explosion in political punditry about the national significance of local voting. What happens on May 23 is, we are told, almost as important as a General Election and national political careers hang in the balance. Is it really being stated that that is the case (though it is true that FG is hyping up the Europeans no end – as they would given that their candidate is not doing quite so well)? Though one caveat. A disastrous local election result could trigger national ramifications, for example Gilmore might have to walk. That is unlikely to pull the government down but it could make things hairy for a while. So let’s not be too sceptical. In fairness Back Room isn’t wrong that local government in this state is marginalised. Given that Fine Gael and Labour have both come out with a vague and uncosted promise to reduce property tax you’d have to suggest that they agree with this. To which you would have to ask if we have all lost our minds. Let’s put this simply – in this country we do not take local government seriously. It is a political sideshow. To go with its few powers [Local government] has fewer strong political personalities. Politicians likely to be remembered in the history books for making big changes never hang around as councillors. At most they use a local election as a stepping stone to the next Dail election, or while waiting for an incumbent TD to take the hint and retire. In our largest cities Dublin and Cork only one person who served as Lord Mayor in the last 20 years has gone on to reach the cabinet. But, it’s telling to me that – for example – it still provides a step along the way to national elections. Look at the track records of most TDs, left right or centre, look at Ciarán Cuffe standing outside Connolly Station the other day handing out leaflets to get elected to an arena of politics that he presumably thought he’d left for good years ago. In a way it almost doesn’t matter if there’s little real substance to local government, it exists as a potential forum, people can and will use it.